The needs of the many outweigh the needs of the few—this is an excuse for heroism and sacrifice. The needs of the few outweigh the needs of the many—this is an excuse for solidarity. 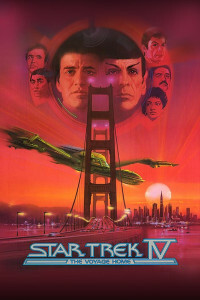 Despite the whole movie taking place in 20th century San Francisco, I would suggest The Voyage Home best represents what the Star Trek universe has to offer: anti-capitalism, world citizenship, ecological stewardship, and the desire for peace. First and perhaps most importantly, as a piece of storytelling, The Voyage Home succeeds at something very, very few stories even attempt: it is a riveting narrative without an antagonist. There is no war. There are almost no shots fired. There is no “them” for “us” to be against. The closest thing this movie has to an arch-villain is the hubris, ignorance, and destructive ways of modern civilization. The closest it has to bad guys are soldiers, cops, and whalers. Sometimes in life there is an enemy that needs shooting. But while I’m a sucker for a clearcut anti-imperial bloodbath (like, you know, Star Wars), there’s no shortage of movies heroizing when one working class person murders another working class person (which is to say, war). And frankly, usually seeing everyone as potential enemies is the problem in the first place. Grand storytelling rarely picks up on that truth. The Voyage Home does. It’s even better than just that though. The movie suggests that whales are sentient and that intelligence is a poor way to judge a creature’s worth anyhow. Most of the jokes are at the expense of how wasteful and stupid we are for polluting the earth and using money. Oh, and the love interest woman has agency and is basically playing Kirk so she can hitch a ride into the future, the film more or less mocking Kirk’s legendary powers of seduction. The whole string of early Star Trek movies hinges around the contrast of James T. Kirk and Spock. Kirk is impulsive and emotional, Spock is logical. This is, frankly, a brilliant storytelling device. Kirk and Spock are one of the great duos of modern writing. Spock says the needs of the many outweigh the needs of the few. Kirk will risk his life and everyone else’s to save a single friend. But what Star Trek gets across in these movies is that both these maxims are true in turns. The needs of the many outweigh the needs of the few—this is an excuse for heroism and sacrifice. The needs of the few outweigh the needs of the many—this is an excuse for solidarity. Explaining the non-dichotomous nature of these two seemingly-at-odds ideas is part of the brilliance of these films. I’m not a fan of techno-optimism. I don’t believe we’ll just figure out fusion and it’ll all be happily-ever-after. And I’m bored of how, in movies, the lovable rule-breaker turns himself in and is exonerated by the law simply because he did such a gosh-darn good job saving the world. But these are minor personal disagreements with a film that, overall, promotes some of the best ideas around. There’s something awkward (or, usually, annoying) about the public mourning of a celebrity. I didn’t know Leonard Nimoy. Any sadness I have about his death is profoundly distinct from any sadness I have about the death of my family members, my friends, or even acquaintances or friends-of-friends. I think it does us a disservice for us (who didn’t know the person) to see the death of celebrities as comparable in any way to the death of those in whom we are emotionally invested. (And it does us a disservice on the whole if we find ourselves emotionally invested in people that don’t know we exist). But I’m sad that Leonard Nimoy has passed. It’s not sympathy for his family or friends, it’s a sadness that stems from the fact that his work has touched my life in a positive way and that the world is poorer for his passing. The guy ‘neck-pinched over his boombox’ has a lovely remembrance of it. I was never so much a Trekkie as a Spockie, but I got to shake Nimoy’s hand once and that fulfilled a childhood dream for me. His influence certainly exceeded his station, ‘not true but Truth’, etc. Damn, this getting older thing is a drag!